Pete Seeger describes folk songs and those who sing them as links in a long chain that connects us with our past. "It's just like humanity, we know none of us exist by ourself, we're part of a long chain," he told Studs Terkel in an interview done 55 years ago. "And sometimes the important thing is not to be the longest link in the chain, but simply a good strong link so we can keep the chain together for future generations." The Humboldt Folklife Society continues its work this week adding strong links to the chain with a whole lot of music, dancing and more. The Humboldt Folklife Festival started earlier this week, it continues Thursday, July 22, with Backyard Bluegrass and Beyond starting at 6 p.m. in Dell'Arte's backyard (the Rooney Amphitheatre) with straight-ahead bluegrass by The Compost Mountain Boys, gospel bluegrass by Huckleberry Flint, grassy jams by The Bucky Walters and music by Old Dog they describe as "true acoustipurification." This has been one of the fest's most popular nights -- you'll want an advance ticket. Friday at 8 it's the third big dancers shindig of the festival at the Arcata Vet's Hall, the Barn Dance, which is what they call their not-so-square version of square dancing. Striped Pig Stringband provides the tunes; caller Tara Stetz tells you when to do-si-do and swing your partner. You'll find 20 acts on two main stages, a kid's stage, sing-alongs, jam sessions and workshops to help take your music to new places. Music lessons start the day: Darren Weiss teaches mandolin, Kurt Hippen teaches clawhammer banjo, both at 10 a.m. (Kurt plays outside at 11:45). Banjo maker Colin Vance of Striped Pig shows you old time fiddling (11 a.m.) or you could learn Irish set dancing from Sue Moon (intro at 11, advanced at noon). Ken Jorgensen (aka Kenny Ray) and family and friends teach vocal harmonizing at noon. (His band, Kenny Ray and the Mighty Rovers, plays at 4 p.m.). Guitar players will have to choose between two sessions at 2: while Rick Park introduces blues slide guitar, Jeff Landen shows you variations on the drop D tuning (he takes the stage for his set at 3 p.m.). The workshops are upstairs in the old Odd Fellows building, same place as a pair of sing-along sessions. First at 1, there's one dedicated to sing-along master Pete Seeger led by Seabury Gould (his band Scatter the Mud plays outside at 4:15). 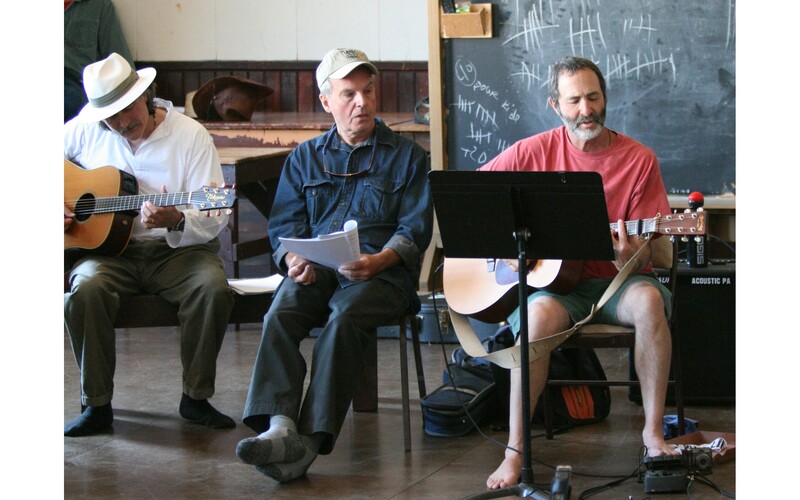 Then Joel Sonenshein, who leads a Folklife song circle the first Tuesday of every month at the Arcata Community Center, revives the very popular Beatles Sing-along. That might not sound very folky, but it worked so well last time they've expanded it to two hours this year. While all that's going on upstairs, the Carlo Theatre downstairs has various things aimed at kids: Dan O'Gara tells stories at 11, Seabury leads a youngster-style sing-along at noon, HLOC KidCo does musical theater at 1, Shoshanna teaches bellydancing for kids at 2 (think scarves), and Tara Stetz shows kids square dancing at 3 p.m.
As noted above there are 20 acts of different sorts spread between the Rooney Amphitheatre stage and another in the street in front of Dell'Arte starting at 11. Among them the ubiquitous Josephine Johnson Band (12:45), the mostly women Singing Nettles (1 p.m.), the No Good Redwood Ramblers, who are actually pretty good (2 p.m.), AkaBella spin-off Vintners Daughters (2:45), a countrified steel set by The Delta Nationals (3 p.m.), the folky groove of Kulica (3:30), sweet harmonies and fine pickin' by Mendo's Blushin' Roulettes (5 p.m.), Django-jazz by Bon Swing (5 p.m.), cosmic country rock by Cadillac Ranch (6 p.m.), acoustic folk pop by The Phoebes (5:45), free-spirited Humboldt jamgrass by Kindred Spirits (6:30), and last but far from least (7 p.m.) the intoxicating green sound of Absynth Quintet. All in all we're talkin' a hundred-plus musicians, dancers and support crew all volunteering their time and energy. Why? Because they are links in that long chain Pete was talking about, reaching back through generations and looking forward, teaching the youngsters, so the chain and the circle will be unbroken. To learn more about the festival or the other links in the Folklife Society chain go to www.humboldtfolklife.org.